I DREAM WITH AN ANGEL TONIGHT. I’ve said it before and i’ll say it again, when cueing up a Lovelock remix, you’d better have your Comme des Garçons overnight bag packed, because you’re headed somewhere else. Weather that be to a private bungalow in Tahiti or to the dark & stormy senior citizen lounge at your local country club, you’re voyaging elsewhere. It just so happens that Lovelock has cast his remix spell on a Sally Shapiro track for the Swedish italo-disco duo’s upcoming remix LP, coincidentally titled ‘Elsewhere’. The album will release tomorrow which remixes each track off their fantastic third album, ‘Somewhere Else’. Typically wherever that “place” Lovelock brings us will be warm… but with the required cool breeze. The smell of cocoa-butter lingers in the air. Someone’s going to be wearing small, white shorts. Lovelock breathes new life into an already beautiful song. The lush rhythms, tropical bounce and crashing waves paint immediate visuals in my mind. This all builds to a chorus that by the end has Steve pushing Sally’s vocals over a cascading waterfall to descend into an underwater soundscape abyss. 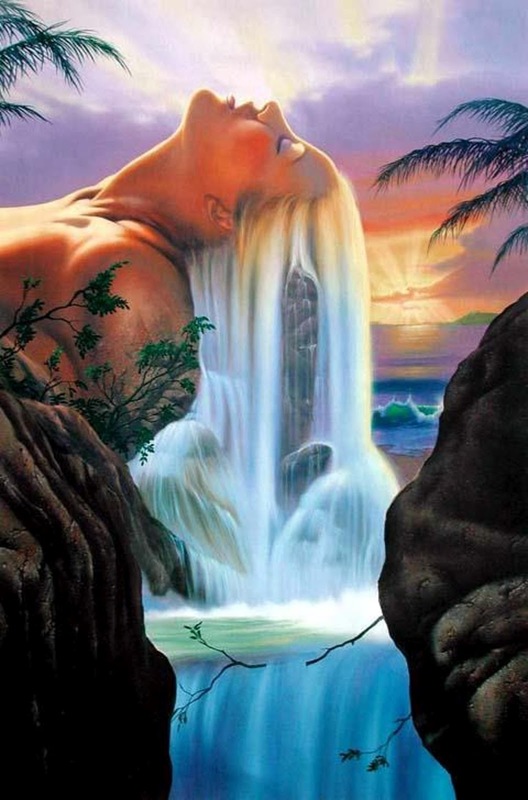 After listening I promptly started browsing through the work of artist Jim Warren, and stumbled on one of his waterfall pieces (see above). They accompany each other immensely. As stated, the remix album releases tomorrow on CD and download. TNUC strongly suggests ordering the CD as the first 200 copies are signed by Sally. You can already order the CD here http://www.johanagebjorn.info/shop.html. If anyone can cite the reference I made in the opening sentence, i'll give you a prize. I think Patrick Bateman had a Comme des Garcons bag. BTW your blog is prize enough! Wow brother, that was quick! DING DING DING, good answer. If you want some TNUC postcards & a TNUC beach ball, shoot me your address.